Do you love some sour in your spice? Are you a fan of Jasmine rice? If yes, then you’re in for a treat! CNN Travel conducted a poll for World’s 50 Most Delicious Foods (Readers’ Pick) and 7 of them were Thai dishes. So, if you’re gearing up for a visit to the Land of Smiles, check out these unique foods to sample on your trip. From the scrumptious to strange, Thailand has it all! A definite must-try for visitors to Thailand, this curry is a mix of spicy, nutty, sweet and savoury that has kept fans obsessed and newcomers coming back for more. To make things even better, it’s not at all expensive, and readily available at most street markets. Just mop it up with rice or bread! Yet another example of the wonders of Thai cuisine, Tom Yam Goong does not disappoint with an explosion of flavours that has you grinning from ear to ear. Remember to ask for less chilli if you don’t pair well with spices! When you’re done with spicy soups, try a refreshing papaya salad. This famous Thai dish is the perfect blend of tangy and sweet. Paired with sticky rice or eaten straight, this flavourful dish is a favourite among locals and tourists alike. If you know Thai food, you’ll know Pad Thai. Together with Tom Yam, this dish has made people all over the world fall in love with Thai food. And of course, when you visit it’s country of origin, you definitely need to give the original recipe a taste! If massaman curry is the king of curries, then Thai green curry is undoubtedly the queen! This innocuous “sweet green curry” packs quite a punch and is made of mostly fresh green chillies and coconut milk. Best eaten with a serving of freshly steamed Jasmine rice. Found in all restaurants throughout Thailand, this is a unique take on a classic dish we all know and love. Typically served in a pineapple half and garnished with pork or chicken floss, pineapple fried rice is sweeter and tangier than the ones available in Singapore. Sliced meat and an ever-evolving number of spices and herbs. These are what makes this fantastic Thai meat dish. The recipe for Moo Nam Tok is just as hotly debated as how its name is pronounced, meaning that you can savour innumerable iterations of this deceptively simple stir-fry during your stay. You’re not dreaming, your lunch is moving. Goong Ten consists of live freshwater shrimp, fish sauce and lime. If you’re in Thailand, it’s not hard to spot a roadside food stall selling this curious but rather yummy “salad”. Brave visitors who don’t mind their food wriggling with every bite should definitely give it a try – it’s quite tingly! If you’ve never tried catfish, then this is your chance! Be prepared for a slight taste of mud due to the fish’s natural habitat. But persevere and you’ll discover that there are a tenderness and sweetness to the meat that is unique and delicious. Ah, the humble omelette, the most versatile of dishes. When in Thailand, expect cilantro, minced meat, chopped shallots, and spring onions in your egg. Fish sauce, oyster sauce, and light sauce combine to form the perfect sauce for this simple dish. Every street food market in Bangkok will have at least one stall hawking this unique delicacy. This crispy treat is fried in oil with all kinds of sauces and spices, making it a fantastic snack to enjoy with a beer on the side. This dish gets its name from the red colour of the cooked cockle meat. Fresh cockles are either steamed boiled and served piping hot. Dip the cockles in the accompanying chilli sauce and enjoy! These healthy and yummy treats can be found in restaurants across Thailand. Served with a sweet or spicy sauce, this is a finger food that you can indulge in guilt-free! The crunchiness of the fresh leaf pairs perfectly with the slight saltiness of grilled fish. Another local favourite with Thai roots, this dish features a meaty broth topped with scallions. You can find these little bowls of joy everywhere in the country, and they are definitely worth ordering, even three at once! This yummy street food is a great snack to munch on while walking around in Thailand. For those with a sweet tooth, get the coconut cream with shredded coconut toppings, while those with more savoury tastes can opt for egg strips or chopped scallions. The Thai version of dango, or rice dumplings, these sticky rice balls are traditionally served at weddings. Made with rice flour and jasmine scented water, you know you’re in for a treat when you chomp on these delightful and aromatic treats! 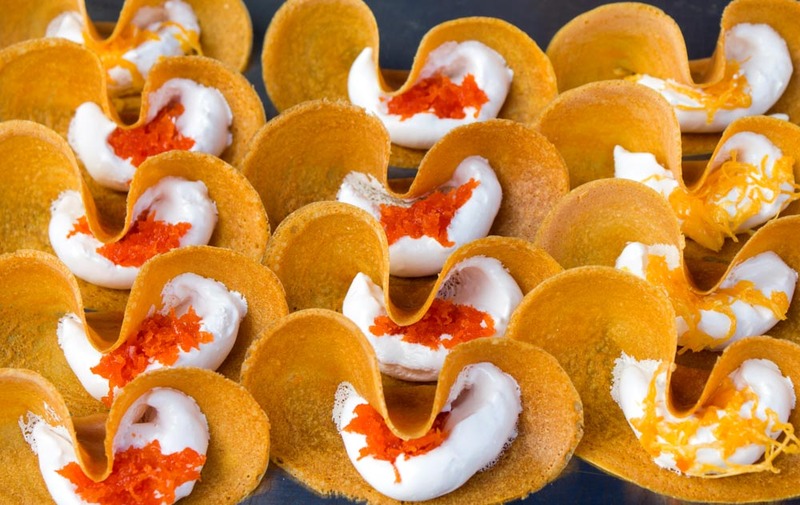 If you love your desserts sweet and salty all at once, then try to hunt down this rare dessert. Made with ice, seasonal fruits, and various toppings like shrimp, this refreshing bowl is the perfect end to a satisfying meal. You didn’t think that we’d leave out this awesome dessert, did you? It may be world-famous but is still a must-try. Several interesting takes on the traditional dish have emerged recently, like the incorporation of flavoured rice, so keep your eyes peeled! The Thai version of Putu Mayam, these noodle balls are made of two types of flour, coconut milk, and natural colouring. Typically enjoyed with nuts and seeds, this is something that most Thais would have eaten growing up. Take those rice balls and shrink them down, then dunk them all in a bowl of cold and sweet coconut milk – heavenly. This sweet dessert dish is usually found in traditional restaurants, but you can find the ingredients at the street market easily enough. 6 things to do on New Year’s Eve (instead of watching fireworks)!